Could the Giuliana Rancic-Zendaya fiasco be chalked up to a bad impersonation? Days into the fallout from remarks Rancic made about actress Zendaya smelling like “patchouli oil and weed,” media reports allege that the embattled “E! News” host was simply trying to channel the late Joan Rivers. Rivers revived the “Fashion Police” franchise for E! and served as its moderator until her death in September 2014. The series was rebooted in January with Kathy Griffin as Rivers’ replacement. Representatives for E! and Rancic have not yet returned TheWrap‘s request for comment. 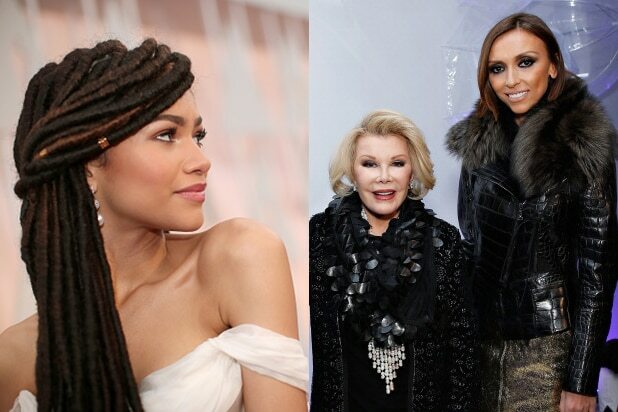 The Zendaya look in question was one she wore to Sunday’s Academy Awards — a demure white dress with her hair styled in dreadlocks, pinned elegantly out of her face. When “Fashion Police” aired Monday, the star of the Disney channel’s “Shake It Up” immediately responded to Rancic’s comments. Reactions to Rancic, who has profusely apologized, aren’t limited to Twitter users and daytime TV hosts like the women of “The View.” Her “Fashion Police” co-star Kelly Osbourne inserted herself directly into the issue. Osbourne tweeted in all caps Tuesday that she did not make the offensive comments about Zendaya, adding that she does not condone racism and as a result was “seriously questioning staying on the show.” She has since backed off that claim following Rancic’s apology.